For over 100 years Decorators Supply Corporation has specialized in creating finely detailed composite replicas of the hand carved wood masters found in our carving library. 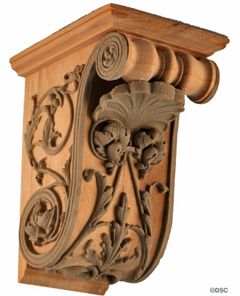 With over 13,000 designs in Decorator Supply Corporation's carving library, we do not stock items. All items are made to order. Decorators Supply Corporation traces its history back to 1883 when the original founders, Simon Strahn and Richard C. Foster, established a partnership to manufacture "artistic decorative accessories". An old lease document dated April 13, 1890 describes the company as a carving and guilders business. By 1893, Decorators Supply had blossomed into a manufacturer of cast ornamental plaster. Decorators Supply became one of the manufacturers of the mouldings that would adorn the buildings and halls showcased in the Columbian Exhibition of 1893. These buildings, embellished with ornamental plaster, became known as the "White City". This World's Fair of 1893 attracted a wealth of world class artists, sculptors, carvers and craftsmen to Chicago. Decorators Supply drew from this rich talent pool of German, Italian and Polish artisans who, over the following four decades, would create the artistic legacy seen today in our product offerings. Decorator Supply Corporation's place in American decorative history is reinforced weekly by calls from clients who, hoping to restore their historic homes and furnishing, find our catalogs and products an unparalleled resource.